I know. I started the new year by sharing a salad recipe. A SALAD RECIPE. (a very good salad recipe though). Are you all mad at me? Can I make up for my silly mistake by sharing some sugar now? I still have a freezer full of Christmas cookies I need to eat my way through, and now it’s almost time to buy girl scout cookies? This fudge is my twist on a girl scout cookie. My FAVORITE of all girl scout cookies. That’s right – once you know how to make vanilla fudge, you can even make it taste like a cookie! 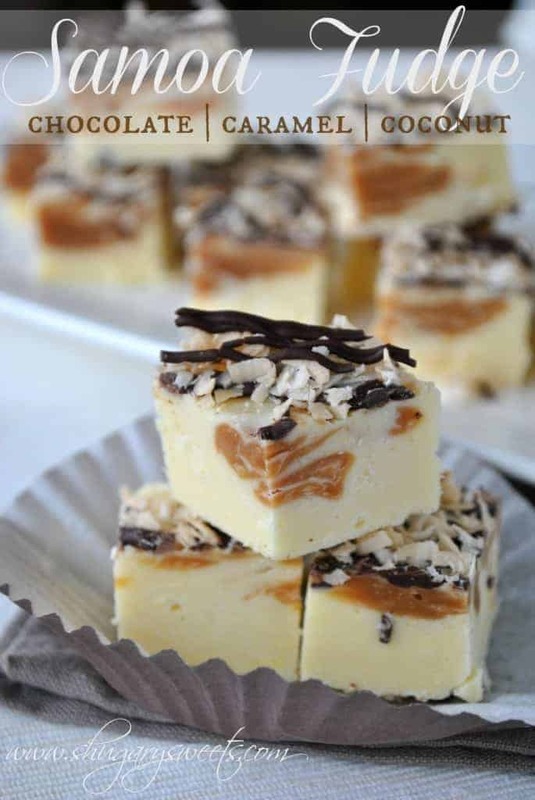 I used coconut pudding mix to give the fudge a creamy coconut and white chocolate flavor. I added in some caramel and swirled it through the fudge. Then, topped it with chocolate and toasted coconut to give the appearance of the Samoa cookie. You’re going to love this one!!! If you don’t, I will gladly accept all leftovers. Want more recipes with Chocolate, Caramel, and/or Coconut? 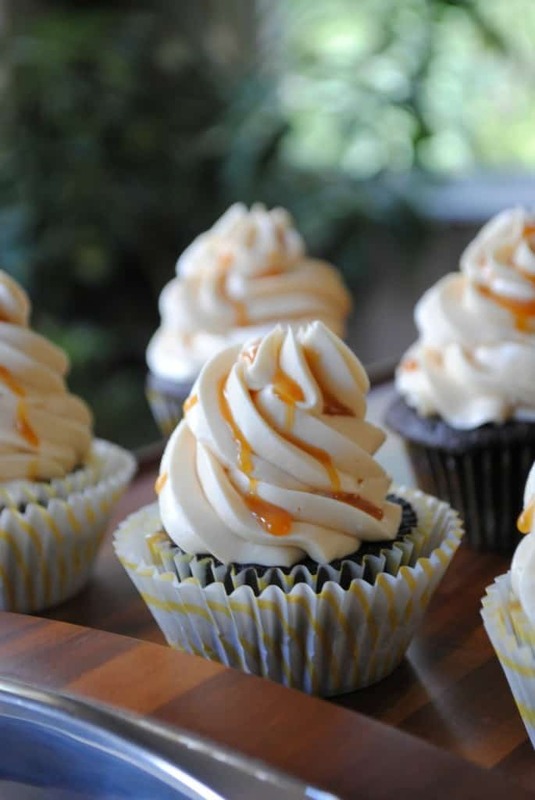 Salted Caramel Swiss Meringue Frosting with Chocolate Cupcakes: no description needed! 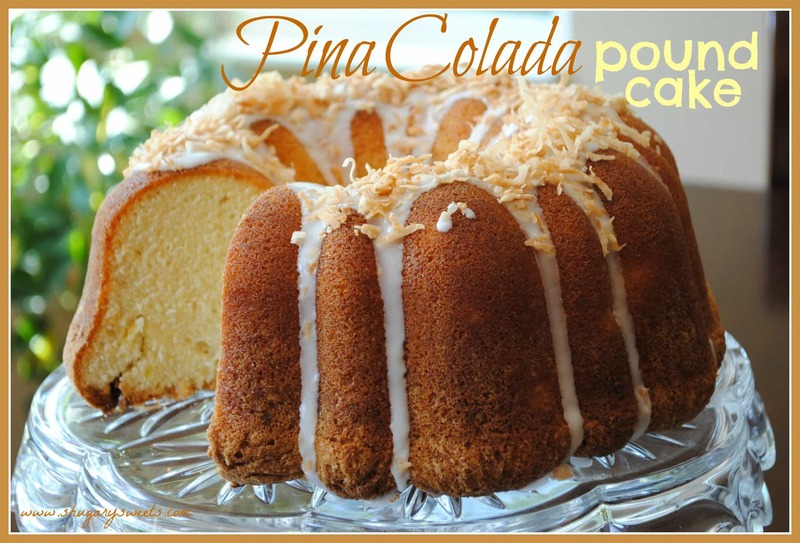 Pina Colada Pound Cake: an impressive coconut dessert! Toast coconut according to package directions. I use sweetened coconut flakes. Set aside to cool. Melt caramel bits with 1 tsp heavy cream in microwave, stirring every 30 seconds until smooth. Set aside. In a large saucepan, heat butter, cream, sugar ans alt on medium high heat. Bring to a boil, stirring contantly. When it begins to boil, set timer for about 5 minutes, stirring continuously. Remove from heat. 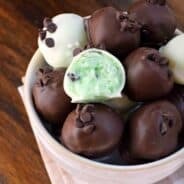 Pour into a mixing bowl and using a stand mixer whisk together the pudding mix, white chocolate and marshmallow fluff until combined (and chocolate is smooth). Immediately pour into a parchment paper lined 13x9 baking dish. Pour caramel over top of fudge (it will be thick). Use a knife to spread and swirl it into the fudge (don't worry if the top of the fudge looks bumpy). Refrigerate fudge for 2-3 hours until set. Melt semi sweet morsels. Spread over set fudge and sprinkle generously with toasted coconut. Cut into bites and enjoy. Store in covered container in refrigerator. Holy cow does that fudge look good!!! 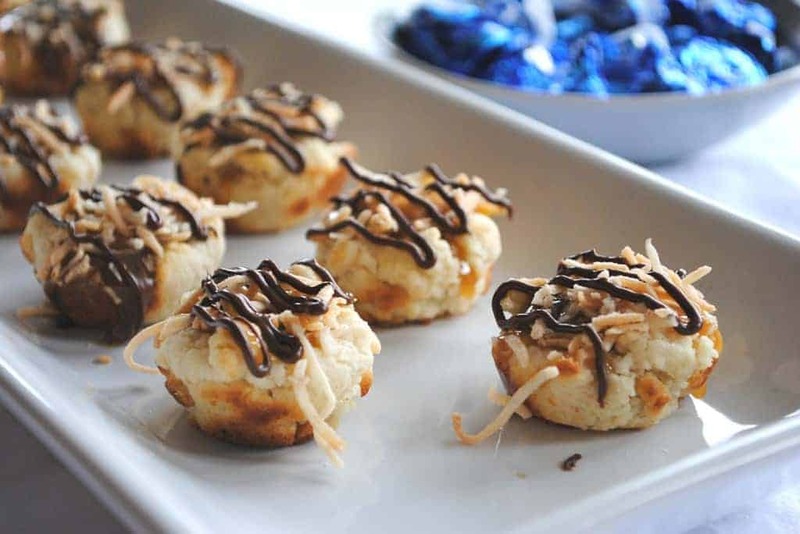 I love coconut anything and with caramel and chocolate….yup, forget about any thoughts of dieting for sure!!! My favorite things on the planet all combined…coconut, caramel, and chocolate!! Each of these recipes WILL be made, Thanks so much!! samoas are my FAVORITE girl scout cookies too! 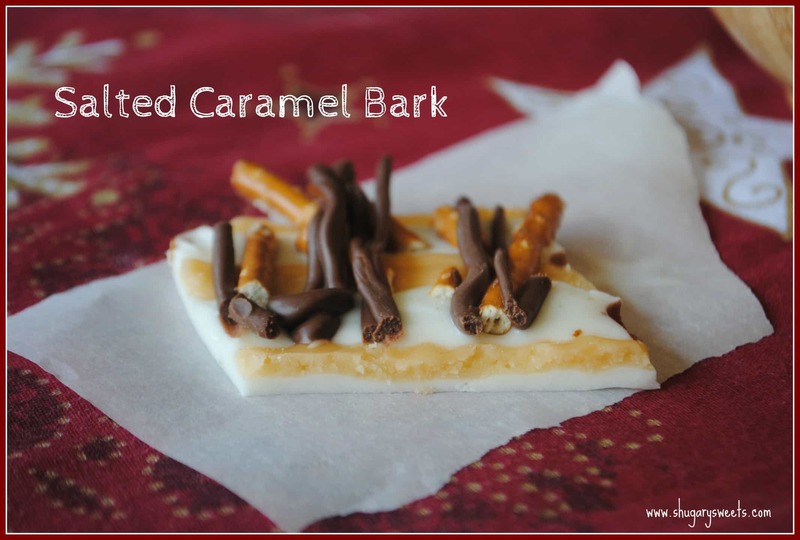 i love that this is in fudge form – perfect for parties and snacking! Those are my favorite girl scout cookies too, and I’ll be trying this fudge recipe for sure!! Thank you so much! Now this is fudge I want to eat!! You are my Idol! Samoas are the only GS cookies I will still shell out the big bucks for. And then when I do get them, I hide them from everyone else. I have to, I mean come on, how many cookies are in the box these days, 12? Maybe 14? Not enough to share. I can’t wait to try this fudge! I always buy at LEAST one box for myself and hide in the back of the freezer. Behind the brussel sprouts and spinach! Keebler, I believe makes a “samoa” type cookie also..
Hopefully you kept some of your girl scout connections! You are right, I am going to love this!!! Samoas are my all time favorite!!! I need to find a Girl Scout!!! I also need to try fudge with pudding! Oh my! Can I eat this for breakfast!!! I love Samoas. That is some tasty looking fudge! oh my…I’m in love!!! Plus, that pina colada cake – you totally speak my language. 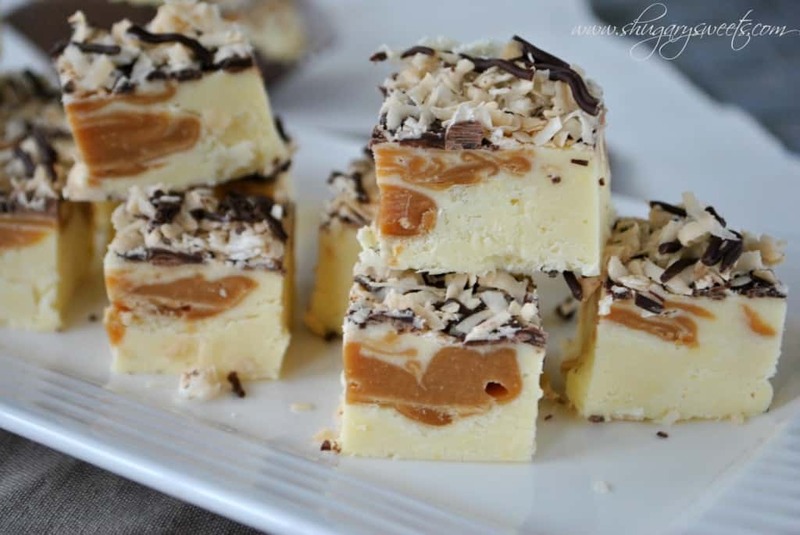 OMG…Samoa fudge!!!! I bow down to you. Wow that fudge looks amazing! Oh this sounds soooo good. I am going to try it. One question, do you use instant pudding or the cooked kind? i need the answer to this question, too – please!!! I used regular (not instant) because that’s what I had on hand. But if you have instant that would work too. Thank you so much for answering my question. Got all the ingredients to make it now! 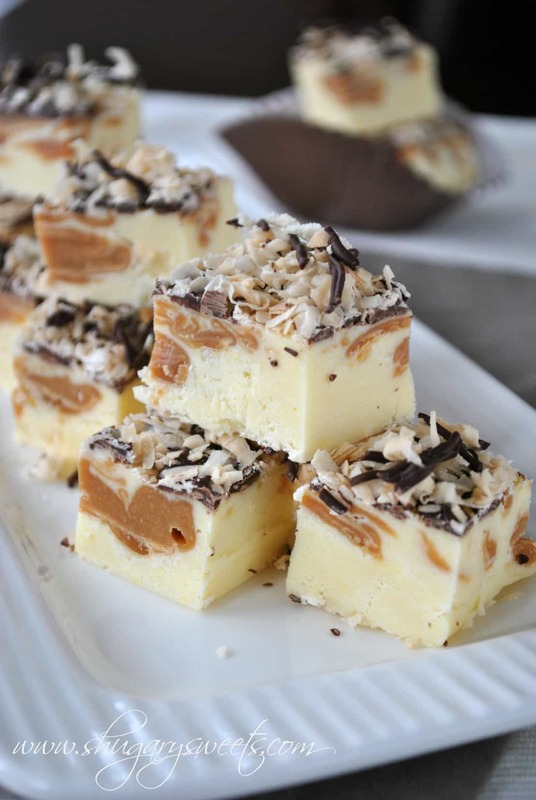 This fudge is simply amazing, Aimee! Samoas are my FAVORITE Girl Scout cookie EVER. I can’t even buy boxes anymore because I am not trustworthy around them AT ALL. I will easily polish off a box in one sitting with no regard for calories, recipe ideas, or the fact that I’ll probably be sick after hehe. 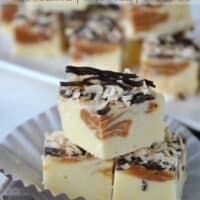 This fudge looks awesome and I want some!! 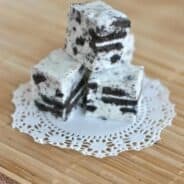 One of my favorite cookies in a fudge – genius!! I am going to make these and ignore the fact that Target already has bikinis up for motivation. Life is short and HELLO I love coconut and caramel together!! Bikinis? Already. Oh geez. I better stop eating fudge. And cookies. Hhahahaha, yeah right! Samoas are my favorite! Can only imagine how addicting they would be in fudge form! Yum, yum, yum! Samoa’s are my fav too! I just found out today, we are a week away from Girl Scout cookies. Can’t wait, but this fudge might hold me over! For a second I was over fudge after way too much at the holidays. Definitely back in the game now. I love this! Kinda flipping out over this fudge… I need my Girls Scout cookie fix soon! I just saw this from your feature at TK, and well how could I not click to see what else you have on your blog? These and so many of your other recipes look De-vine! Glad you stopped over Kari!! This is the best variation of fudge I’ve ever seen!! Thanks Steph. 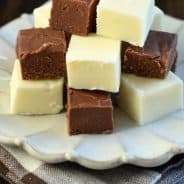 It’s one of the best fudge flavors I’ve ever made! I can’t believe this has just happened. I think I need to go overdose on fudge now, and then stick a glob of somoa ice cream on top of this…yes, that sounds like a happy new year sort of thing to do! I know. It happened. And it’s gone. And samoa ice cream? WANT. I love samoas, too! I can’t wait to try this. Pinning. Holy smokes! I can’t wait to make this. Fudge + samoas = me very happy!!! I am so crazy craving for this! These look delicious, I love Samoas! I host a link party each Thursday – I would love to have you join and share this. I still have never ever made fudge…this one could be trouble…I think I’d eat it all! I made this! and let me tell you it is to die for! YUM!!!!!!! Does this call for instant pudding or the cook kind? Samoas are my FAVORITE GS cookie. I may or may not have 3 boxes in my pantry :-S I love the big vein of caramelly goodness in the pictures! I agree with all of the above posts about loving the girl scout cookies and how amazing this fudge looks and all that but I don’t see where anyone has actually tried to make the recipe. On that note I have to say that the product I ended up with after explicitly following the directions seems to look nothing like yours and the consistency is more that of taffy, not fudge. It also does not taste like coconut which surprised me considering the pudding should have given it some extra flavor. I’m not exactly sure what happened. Also, in a 13×9 pan, my concoction is lacking the height your pictures show. Is it a technique thing? Are there instructions I’m missing here? I’m not very experienced at candy making…baking is more my thing. Any ideas what I can do with a pan of white chocolate caramel taffy? For the Samoa fudge did you use instant or cooked coconut pudding. I use the instant and beat it for a while and it is still grainy. Any suggestions? I live in Canada so I cant get the Kraft caramel bits. WHat is a really good substitute so I can make this recipe?